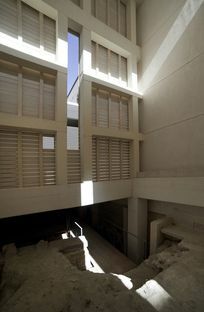 The Artemision pavilion now overlooking Piazza Minerva on the Island of Ortigia is a project begun in 2005 by Vincenzo Latina for improvement of the archaeological site of the temple of Artemis, commissioned by the city of Syracuse. A little museum pavilion now stands on the site of the former church of San Sebastianello, providing a new access route to the Artemision site from Piazza Minerva. The project, begun in 2007 and completed in 2012, is part of a wider-ranging urban redevelopment plan implemented by the local government centring around the Island of Ortigia, the heart of Syracuse. The ruins of the Artemision were discovered during archaeological digs in the ’60s, when the remains of an Ionian temple dedicated to Artemis, according to the mostly widely accredited interpretations, were found under what is now the city hall, designed by Gaetano Rapisardi. At the time Vincenzo Latina’s project was begun, the area formed a gap in the row of buildings overlooking Piazza Minerva; behind the dangerous ruins of the façade of a building that had been torn down (and was used at that time for putting up posters and announcements), it had even become the site of an electric substation, a big prefabricated concrete building standing right across from the cathedral of Syracuse, in which the structure of a Doric temple of Athena is still visible, converted into a Christian church, then a mosque, and finally given its current Baroque style. Architectural regeneration as a tool for prolonging a building’s life is part of the city’s history, as demonstrated by the fate of the temple of Artemis, mirroring the temple of Athena across Via Minerva. Penalised by history and neglected over the years, during the digging for this new redevelopment project the site revealed the remains of a number of huts of a late Bronze Age Sicilian people and the crypt of the church of San Sebastianello, which once stood where the city hall is now located. As a result of Vincenzo Latina’s project the foundations of the temple, formerly accessible only via a utility staircase in the city hall building, now have direct access and a façade on the piazza. The new pavilion covers, protects and enhances the archaeological site exposed by the excavations, presenting it to the people of the city through a symbol of reconnection, fitting into the walls around one of Syracuse’s most important squares. Vincenzo Latina explains: “The building’s perimeter has an understated masonry structure which favours structuring of the wall and appears to have a medieval or Catalonian character. This is the prevalent character of the walls of many of the buildings in Ortigia, which were given a Baroque look after the 1693 earthquake.” It is an architecture of continuity, which serves to encourage contemplation of the place: from the inside of the pavilion, the vertical cut in the hard limestone wall frames the column forming the corner of the peristyle of the temple of Athena, englobed in the front wall of the cathedral. Its tall, hollow structure is a container for light, which comes in through a well and is broken up on the light inside walls, illuminating the excavations below and the exhibition route above.